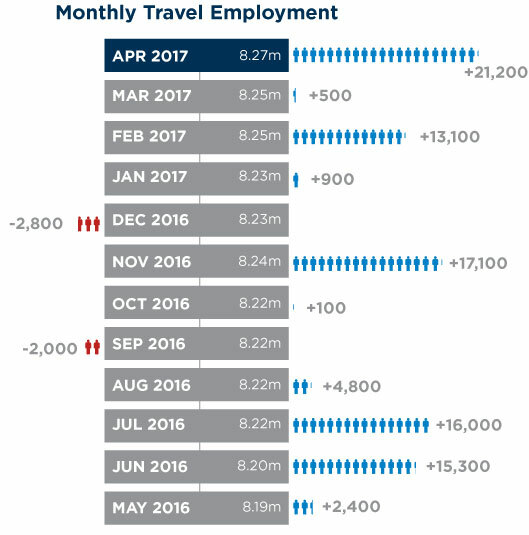 April was a very good month for travel employment. The travel industry added 21,200 jobs in April 2017, accounting for 10% of all new non-farm jobs, according to the U.S. Travel Associationâ€™s analysis of Fridayâ€™s Labor Department employment report. This is the travel industryâ€™s highest monthly job increase since November 2015. Job gains occurred in nearly all travel-related sectors. Over the past 12 months, the travel industry has added about 86,600 jobs. The travel industry remains a consistent job creator for the U.S. economy, adding new jobs 10 out of the last 12 months and continuing to support one in nine American jobs. The monthly jobs report from the Bureau of Labor Statistics indicates that total non-farm employment increased by 211,000 in April, and the overall U.S. unemployment rate remained nearly unchanged at 4.4%. Copyright 2017 U.S. Travel Association. All rights reserved. From http://www.ustravel.org. By David Huether, Senior Vice President of Research, U.S. Travel Association.